They are just darn cute. You get your very own mini cake . . . and nobody has to help you eat it! Don’t you love these new foil liners by Wilton. They hold up . . . keep their shape . . . and retain all of the color. I found really cute liners at Walmart. 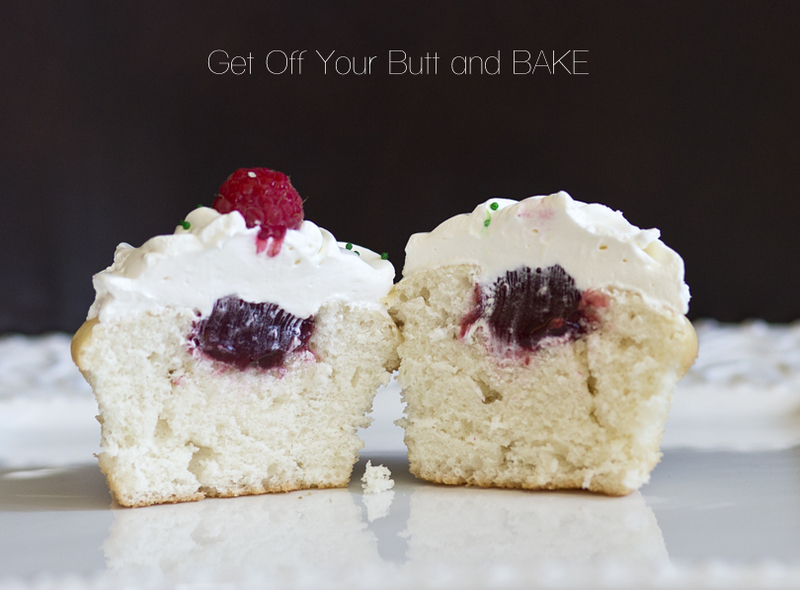 These cupcakes are Vanilla and inside is a delicious Raspberry filling. You can get the filling at the Prepared Pantry or make your own. I promise you though . . . it’s really good, and it won’t weep inside the cupcakes . . . which makes it even better. 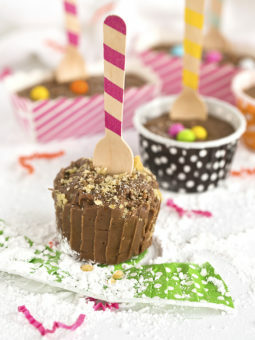 Simply poke a dowel or the end of a wooden spoon in the center of each cooled cupcake. An apple corer also works, but will leave a larger hole to fill. The dowel seems to be the perfect amount of filling . . . at least in this house. See that bag of Raspberry filling? It goes a very long way, and keeps very well in the fridge. You don’t even have to have a long tip to squeeze the filling into the hole. You just snip a corner of the bag and fill! They have every flavor of filling under the sun. My favorites are the Bavarian Cream, Raspberry & Lemon. The delicious frosting is like Lime Whipped Cream Fluff! It’s simple to make and holds up well on the serving table. You can make them a day ahead and store them covered in the refrigerator. 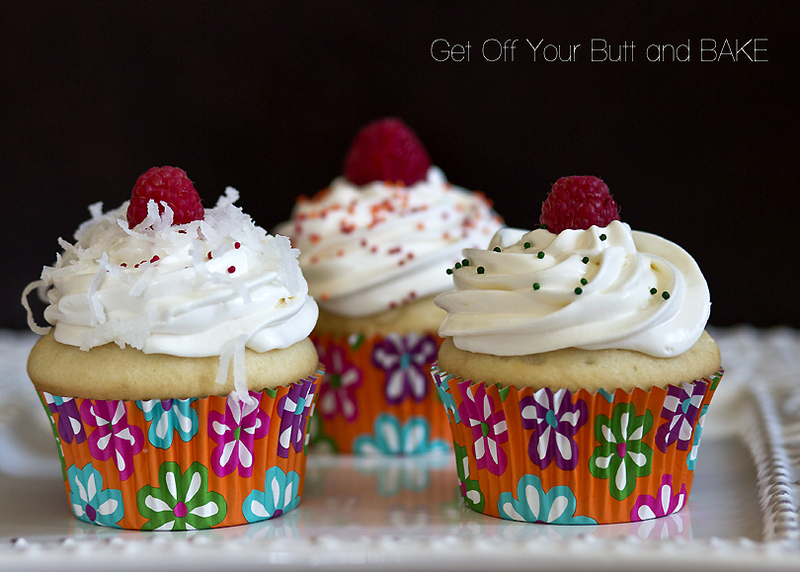 If you don’t like a really sweet frosting . . . this is for you. I flavored it with freshly squeezed lime juice, but you can substitute with: Lemon, Orange or even pomegranate juice. You can also use a bit of oil flavorings as well. 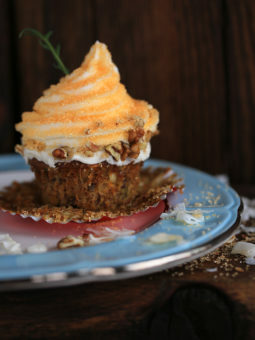 The Vanilla cupcake recipe is my favorite with just the right texture & crumb! If you have stored the cupcakes in the fridge, let them come to room temperature before serving. 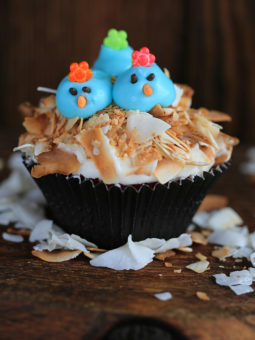 Make cupcakes and turn some smiles on! In a large bowl, beat milk, lime juice and lime peel with wire whisk until smooth and thickened. Fold in whipped topping until blended. 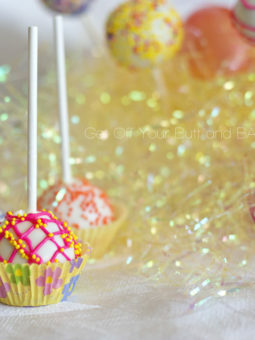 Place in pastry bag with a decorative tip and pipe over the top of the cupcake. Sprinkle with coconut and add a Raspberry. 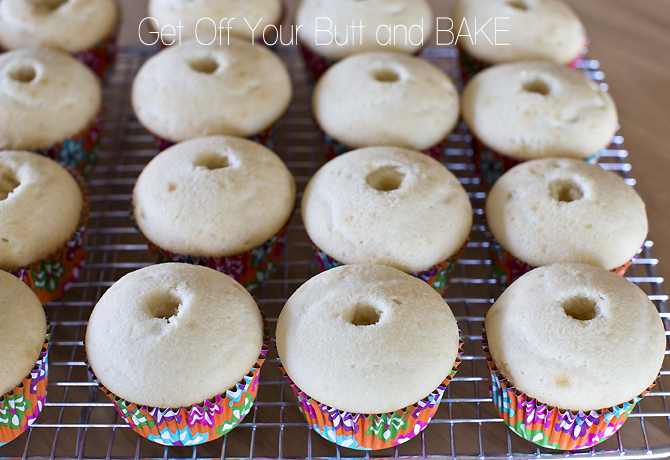 Keep cupcakes Cool in refrigerator until ready to serve. Note: If you have put the cupcakes in the fridge, let them come to room temp before serving Room temperature cake is better than cold cake! In the directions for your Lime Fluff Frosting you don’t say what to do with the container of whipped topping…. Do you just fold it into the condensed milk after it is beaten? being in a big hurry! I used a Wilton 1M tip. It’s my favorite! I guess the one thing that is really important is to only fill your tins 2/3 full….don’t overfill, or they won’t be pretty. I use a large ice cream scoop for the regular size cupcake. I just used Cool Whip. It’s really quite yummy even with Cool Whip instead of real Whipped cream. The frosting holds up well. I just made these and I could sit and eat all of them by myself!!! They are so delicious!!! I was wondering if you had tried doing the frosting with other flavors, like a lemon or even an almond/cherry (amaretto) flavor? by just replacing the lemon with the lime? If you have the flavored oils, you can use any flavoring you choose. I’ve tried them all!! !